We are asking all who work or study in the field of evaluation to consider submitting a proposal sharing your work in evaluation practice or theory at the annual Spring Exchange of the Ohio Program Evaluators’ Group (OPEG) on May 18, 2018 at Otterbein College in Columbus. The submission deadline is 5:00p Friday, January 12, 2018. 3) Annual business meeting to update you on OPEG activities past, current, and future. o the experience level of the intended audience. Full session presentation: This is a longer session of approximately 45-60 minutes that is focused on a single topic. Examples of such sessions include: symposium, panel discussion, skill-building session or workshop, or demonstration. Submissions should include a brief outline of the session and how it will be structured. Sessions are required to allow 10-15 minutes for questions at the end. 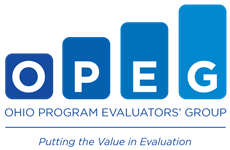 The OPEG program committee will determine the actual length of each session during the review process and will provide that information to accepted presenters. Brief presentation: Presentation of 10-15 minutes that is focused on a single topic. Related presentations will be grouped into 45-60 minute thematic sessions. Poster presentation: A visual presentation that will be on display during the Exchange. You will have a chance to stand by your poster during a scheduled poster session to answer questions. Notification of review results will be sent out by email to the individual submitting the proposal by February 9, 2018. It is the responsibility of each submitter to inform any additional participants listed in the proposal. The primary presenter must be a paid member of OPEG by the time of the Spring Exchange (invited speakers may be exempted from this requirement). Copies of presented materials in Microsoft Office or Adobe PDF format must be submitted to the Program Committee by May 2, 2018 for posting on the OPEG web site. Questions? Problems submitting? Contact Barbara Krannich at bkrannich@prism-health.com.